It was an extremely early morning, arriving at 3:30am where we had to get on the bus for a 10-hour journey into France. We arrived in France at approximately 2 o’clock, after a Eurotunnel Crossing, before journeying onto the Canadian National Memorial at Vimy Ridge. We stretched our legs and had a tour around the preserved trenches, underground tunnel tour and looked around the factual museum, before visiting the Vimy Ridge Memorial itself. It is magnificent, a huge, reflective white memorial with praying angels and thousands of inscribed names of those who were missing and who died in that area. To end this day, we walked into the local town of Albert and had a lovely meal out at a local restaurant. We then went back to the youth hostel and had a relaxing evening after a long day. On a very cold, frosty morning we first visited the Devonshire Cemetery on the Somme Battlefield. This was very close to our heart as the majority of those who died there came from the same places as us. A lasting phrase from the cemetery was “The Devonshire’s Held This Trench, The Devonshire’s Hold It Still”. We also saw the landscape where the Battle of the Somme was fought. We then made a quick stop off at Lochnagar Crater; it was unbelievable. 60,000lbs of dynamite had been blown up underneath the German trenches. It was said to have been heard in London! It threw up 4000 tonnes of earth into the air, which doesn’t bear thinking about, to experience such horror. 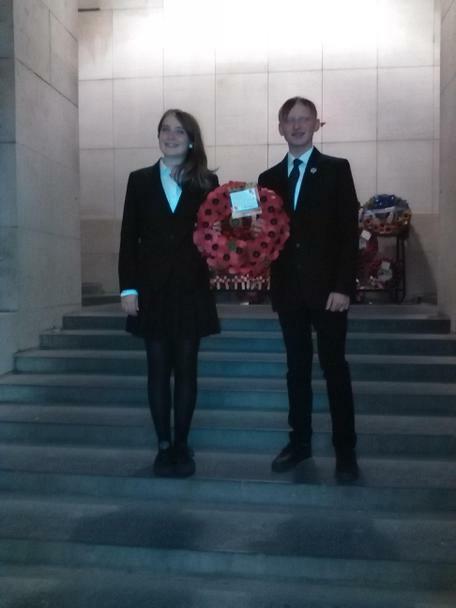 After this we travelled to the Thiepval Memorial; this was a moving part of the trip where Rebecca Bromell laid a wreath for her great- great uncle, whose name is on the memorial. The memorial at Thiepval is to commemorate the missing in the Somme, with 73,000 names carved into the stone. Emily Bromell read out her beautiful poem in a ceremony ran by the British Legion, which is being conducted every day from July 1st to November 18th for the 100th Remembrance of the Somme. In the afternoon, we went to Newfoundland Memorial Park, this is where 800 Newfoundland men went over the top on July 1st, but then the next day only 68 men reported to be fit for battle; this was a huge loss for a tiny country. We journeyed through the restored trenches, experiencing what the soldiers would have seen 100 years ago, and heard the terrible story of the huge losses when they went over the top. The battlefield is exactly the same now as it was after the battle took place. Finally, we journeyed to the medieval town of Ypres and visited an amazing museum at Zonnebeke that had recreations of the dugouts where the soldiers slept and lived, as well as a trench experience. This was very interesting as you felt as if you were a soldier and you realised the hardships of what war was really like, this was just where they had to stay, let alone going over the top and fighting. We learnt about the officers’ uniforms and what they ate. This was quite eye opening as you don’t think about the everyday life of a soldier at war, you just think about the fighting. At the end of this busy day we arrived at the hotel where we had a delicious meal, started on our scrapbooks and had an hour of free time and then went to bed to catch up on some much needed sleep! After another early morning, we travelled to the moving ‘Brooding Soldier’ memorial. As a group we voted this our favourite and the most fitting memorial for the war. Even though it was smaller, and more hidden than the likes of Vimy Ridge, we felt it was closer to what the war was all about, with the death and suffering of the war, rather than the glory. Next we visited the largest British war cemetery in the world, Tyne Cot Cemetery, which pupils found really breath-taking. This is because it was astounding to see so many graves, nearly 12,000, all in one place, showing the real effect of the war and how it played a part in our history. After this it was into Ypres itself to view the Menin Gate Memorial to the Missing, which contains more than 56,000 names. Evie Bawden found her great-great grandfather on this memorial, William Hammerton, who died in 1915. We then went to an amazing Belgium chocolate shop. It was run by Hans and Stephanie who announced many deals and offers to the school! It was really fun to try different chocolate from different countries and for such an amazing price! This was a highlight for many of us! After we stocked up on chocolate we visited the ‘In Flanders Fields’ museum. This was really fun and the most interactive museum so far! There was a wristband that pupils scanned throughout, which told a story of a character through the war. Our next stop was Essex Farm cemetery. This was extremely interesting and eerie as it was the site of the first gas attack and John McRae’s field hospital. It was really eye-opening to see the kind of conditions the wounded soldiers would have been treated in. In the neighbouring cemetery lies a fifteen-year-old boy called Valentine Strudwick, which was a real shock to think about. Next on the list was Sanctuary Wood trenches and tunnel. This was an amazing experience of seeing the trenches as they would have been during the war. We wore our wellies as we walked through a very dark and muddy underground tunnel used in the war for communications. We had a great dinner out in Ypres before the ceremony which had over one thousand attendants. It was here that Miss Sampson, Kai Trivett and Rebecca Bromell laid a wreath. The ceremony has been running every single night since the end of World War I. It was a massive honour and an amazing opportunity and something both pupils will remember forever. This was the last day and the day we travelled back home to England. We got up and had breakfast early in order to make all our stops and get home for a reasonable time. Our first stop was not far from the hotel and was a cemetery called Prowse Point Cemetery. In it lies Robert Taylor, who died in December 1914. He is the great, great grandfather of Emma and Abby Knight, who managed to make a pilgrimage to his grave and lay their poems. Next to it, it also had a small memorial full of footballs. This was to show the Christmas football match the soldiers had in 1914. We then had a long journey through Belgium into France and had a forty-minute stop at the hypermarket. Afterwards we caught the Eurotunnel back into England. It was an amazing trip and I would like I thank everyone who was involved in making it happen.